Value based airline, JetLite promises to present value for money, economical fares, in-flight shopping, 'Buy on board' in-flight meals, and more. JetLite is subordinate of Jet Airways India Ltd and it was acquired by Jet Airways during April 2007. Jetlite provides online Ticket Booking & Flight Status facilities given on the official website at www.jetlite.com. You can book, pay and print your e-Ticket and enjoy your travel with Jetlite. Refer this article, to know more information about how to book online Jetlite Ticket and Flight Status. Jetlite airline was founded on 20 September 1991. By two Boeing 737-200 aircraft, Jetlite started operation on 3 December 1993 as Sahara Airlines. In beginning, Jetlite mainly focused on northern sectors of India keeping Delhi as its base, then it extended its operation to cover all the country. On 2 October 2000, Sahara Airlines was rebranded as Air Sahara and on 22 March 2004 it started international carrier with flights from Chennai to Colombo. JetLite connects 28 domestic and 2 international destinations with more than 108 flights daily. JetLite is only based Airline in India to offer frequent flier miles in partnership with JetPrivilege. Jetlite has features for booking online, managing booking, IVR ticketing, JetProtevt travel insurance, ckeck-in, scheduling, seeing flight status, travel advisory, etc. JetLite provides ‘Manage my booking’ and ‘PNR Status' features. These features make the booking procedure more convenient for users. JetLite.com has offered web check-in facility thus the customers can choose their preferred seat and print their boarding pass. In press release, JetLite stated that they have started a new online booking service to fliers. The Fliers can easily book their tickets online after following the booking process. This booking process has three parameters like Lowest Fare, Fixed dates, and Flexible dates. You can select any parameter and book your tickets online, then you will receive booking confirmation SMS on your provided mobile number and email. Mr Sudheer Raghavan, Chief Commercial Officer, said on the launch, “We wanted a flexible solution to keep up with the changing times in today’s dynamic and competitive market. This is yet another innovative step by Jet Airways to offer the best to our customers both in terms of experience and value added services.” He also said that this plan will help the company reduce on distribution costs and build customer loyalty. 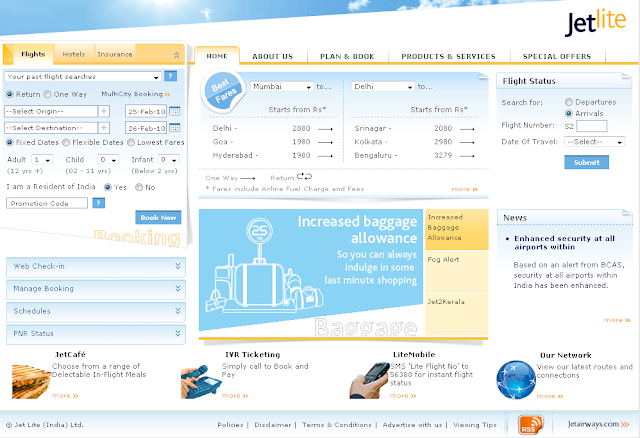 Jetlite online Ticket Booking process: JetLite presents its modern online booking facility. It provides full flexibility with a large range of flights and color coded fare families which help you for finding your fare as per your need. On basis of seat availability bookings are confirmed directly. You have to select Yes or No for Resident of India. Flight Status of Jetlite: Jetlite gives facilities to inform about your required flight status which is mentioned on its homepage. You have to select departure or arrival option and date of travel. Then enter flight number. So you can get information about your required flight is available or not.